The majority of these tainted comments were easy to ignore, because I felt good for forty, maybe even for twenty. I’m diligent and at times a bit obsessive about my health. My dad was a two-pack a day smoker and alcoholic. My Type II diabetic mom resembled Jabba the Hut from the thighs up thanks to an affinity for fast food, Hostess snack pies, and mindless eating. Both of my parents died when they were sixty-three. This, I vowed, would not happen to me. With a nod to Julia Child’s edict of “everything in moderation, including moderation,” I eat anything and everything as long as the ingredients on the label are recognizable, real foods, and I work out six days a week. Before you let your eyes roll back into your head, consider this as well: I drink two cups of black coffee every morning; I drink wine every night while I make dinner; and I have no shutoff valve when it comes to pizza or homemade ice cream. My diligence has paid off. I’ve never broken any bones or suffered a serious injury. My experience with surgery and anesthesia is limited to having my wisdom teeth removed and a decade later a tiny, but painful bone spur in my hand. Then, in my mid 30s, I was diagnosed with degenerative disc disease (DDD) in my lower back. DDD isn’t really a disease; it’s a condition that occurs when fluid escapes from the discs that separate the vertebrae in your spine. The discs act like shock absorbers for the vertebrae. As the discs lose fluid, there is less padding between the vertebrae, and they come closer together creating instability and sometimes pain in the spine. My x-rays indicated that this had happened to four discs in my lower back. And as my doctor put it, “You can’t get the jelly back in the jelly doughnut.” She recommended a traction machine, so I could hang upside down and relieve the pressure in my back. At her urging I limited my runs to four times a week and started practicing more yoga. She also gave me exercises to strengthen my core, a word that I once thought only referred to the part of an apple that’s not worth eating. Traction, yoga, core strengthening, they did the job. And then I turned forty-one. Late last fall, my back pain returned. Once or twice a week sharp pains in my lower back would wake me in the middle of the night. Sitting down for breakfast was often enough to make me wince with pain. I was certain my jelly-less doughnuts and obsession with running were to blame. Morning stretches to loosen the muscles in my lower back were added to my regimen and running was limited to three days a week. This helped, but by Christmas I was waking up with back pain four to five times a week. No matter how good I felt before bed, the pain returned while I slept. Simple yoga poses, especially balancing poses were getting noticeably harder and at times even painful. Worse still, my running pace was getting slower. Depression settled over me like dense fog. This is what it means to get old, I thought. Greg frequently suggested I return to the doctor, but I didn’t see the point, not yet. On my last visit to the doctor she said that eventually my back pain would become intolerable and impossible to manage with yoga and traction. At that point surgery would be my only remaining option. Having watched helplessly from the sidelines as a close friend went through the same surgery over the holidays, I didn’t have the courage to make the call. Besides, the pain wasn’t unbearable, until it was. Did you know that your hips move up and down as you walk or run? I did, but I didn’t know that only one of mine was doing this. According to my doctor my right hip had completely locked up and from the exaggerated asymmetry of my back muscles, which was the direct cause of my back pain, she was certain it had happened several months ago. She was surprised that I could walk let alone run. So the excruciating pain I’d been experiencing for months had nothing to do with the lack of jelly in my doughnuts. And unlike my degenerating discs, the condition was treatable. My miracle worker had my hip unlocked after forty-five minutes of electric stimulation, acupressure, and joint manipulation. The knots and over-developed muscles that were compensating for my locked hip would take longer to goad back into their normal states. I was so relieved both physically and mentally that Greg’s litany of “I told you so”s didn’t even annoy me. But as they say, if something seems too good to be true, it probably is. The locked hip was likely the result of running on unyielding concrete sidewalks. “But running is my thing,” I finally managed in spite of the giant lump that had formed in my throat. She didn’t get it. There was no other thing. Running is more than exercise for me. I don’t love it because of the cardiovascular benefits. It soothes me. It’s meditative, contemplative. My best ideas come when I’m running. Problems are solved when I run, big ones, small ones. I pray when I run. I practice gratitude when I run. I’m most alive when I’m running. I’ll skip the part where this forty-something started to cry like a four-year old. I got the long-awaited green light to run last Friday. Maybe it was because both hips were properly functioning or maybe it was my state of mind, but it was the best run I’d had in months. I ran again on Sunday. Two days later, I triumphantly returned to the doctor only to learn that my hip was partially locked again, even though I wasn’t experiencing any pain. Lying prone on the table with my face buried in a tissue-covered cradle, I waited for my doctor to deliver the bad news. At least this time she wouldn’t have to see me cry. My self-pity gave way to deep shame as I thought about the people who’d recently lost their legs in the Boston Marathon massacre; I could still walk even if I couldn’t run. And then something surprising happened. “It’s not as bad as I expected it to be,” my doctor said. “In fact, your hip was pretty easy to unlock. Next week I can show you some exercises that you can do, so you can unlock it on your own.” I cried anyway as the tension gushed out of my rigid body. This old mare wasn’t ready for the bullet in the pasture after all. I would run another day. And I already knew my next run would be all about gratitude. Make mint simple syrup: Chop mint. In a small saucepan bring sugar, water and mint to a boil, stirring until sugar is dissolved. Simmer syrup, undisturbed, 2 minutes. Let cool. When ready to use, pour syrup through a fine sieve, pressing hard on solids. Syrup keeps, covered and chilled, for 2 weeks. Combine the simple syrup, white wine, brandy, and sliced strawberries in a large pitcher or divide evenly between two smaller ones. Refrigerate until ready to serve. Pour over ice. 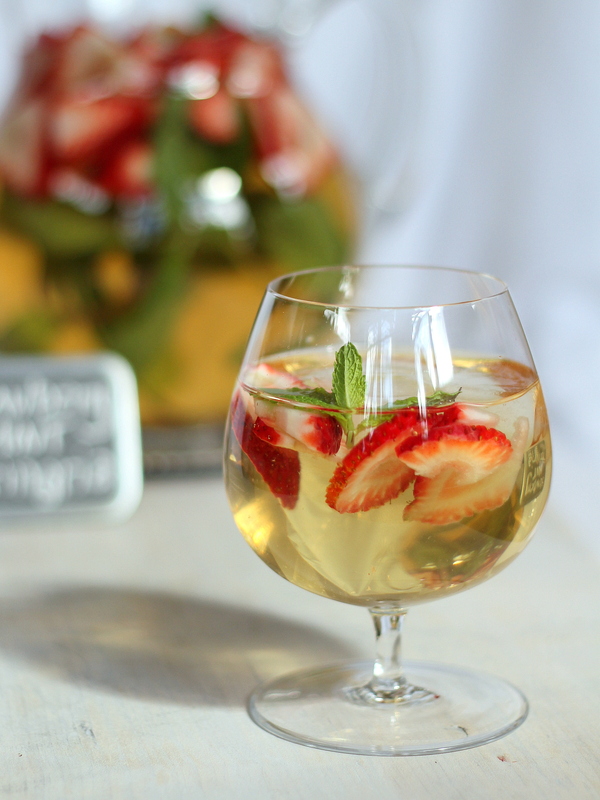 Top with ginger ale and garnish with a fresh strawberry. I never knew you were in pain! So sorry for your troubles, and so glad they are resolving. And this drink looks mah-velous. That looks amazing – I’m in dire need of one right now. Beat you by one year. Oh, Bobbi I can relate. My body has failed me in major ways this past year. My neurotic exercise routine that has been part of my life since I was a teenager has been forced to change. I am grateful I am still able to do and benefit greatly from yoga. We need to toast all we have to celebrate with a Strawberry Mint Springia soon!